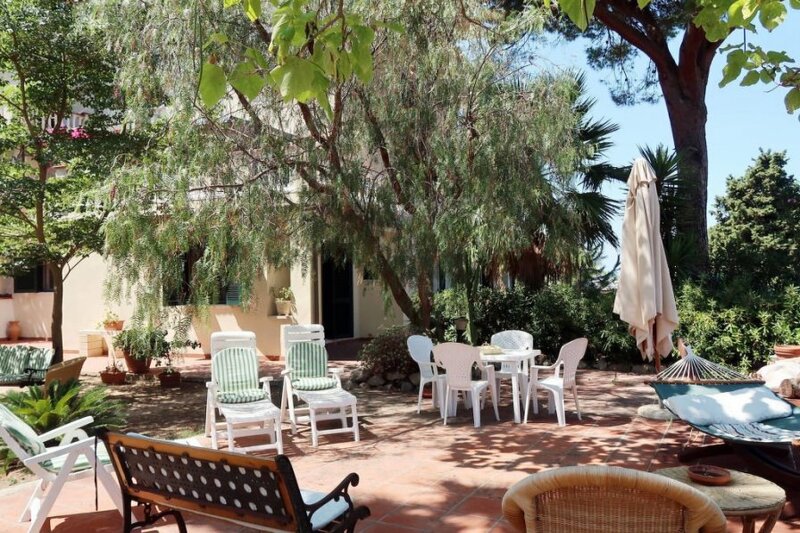 This 2 bedroom apartment is located in Santa Domenica and sleeps 5 people. It has WiFi and barbeque facilities. The apartment is within walking distance of a beach. Apartment, 4 - 5 people, 3 room/s, 2 bedroom/s, 2 bathroom/s, approximately 120 m², 1 floor/s, apartment on ground floor, separate access to the property. Caretaker lives in the house. Feature: Property in a multi-family housing (max 4 floor(s), 7 units in total). Furnishing: good, friendly, tiled floor. Equipment: cable TV; washing machine; electric radiator (on request). € 10 per person and stay (depending on occupancy). Firewood if required. Electric radiator (on request), € 10/​day. Optional intermediate cleaning against payment, € 10/​hour. Holiday resort tax. Linen/towels available. Deposit € 200 (in cash). Extra bed double sofa bed, € 12 per day (on order). Cot/​High chair free of charge (on request). Pet 1 pet allowed, € 5 per day (please advise prior to arrival; additional animals on request only). Situation: in the district Riaci, altitude 40 m.
Estate (shared use with the owner and holiday guests): approximately 3 ha, partially self-contained (fence, hedge, electric entrance gate), in a hillside, terraced, trees, natural surroundings, gravel, flagged floor, fruit trees. Owner lives on the property. Outdoor facilities(shared use): reserved open space, furnishing provided, sunshades. Plot description: parking on the estate. Balcony 9 m², furnishing provided, sunshade. The agent describes this apartment as a family friendly holiday rental ideal for the summer holidays. It is also good value for money. This apartment is located in Santa Domenica. The nearest airport is 55km away. It is set in a very convenient location, just 0 metres away from a beach and only 2.5km away from the city center. The apartment is adequately equipped: it has a dishwasher and a washing machine. It also has a BBQ. There is an entertainment park nearby. The apartment is suitable for family holidays in the winter and summer; it is also suitable for elderly guests.